I’m always curious about summer camp stories! This one has a different angle with an adopted girl learning to figure out where she fits in. Who eats Cheetos with chopsticks?! Avery and Becca, my "Chinese Sisters," that's who. We're not really sisters-we were just adopted from the same orphanage. And we're nothing alike. They like egg rolls, and I like pizza. They're wave around Chinese fans, and I pretend like I don't know them. Which is not easy since we're all going to summer camp to "bond." (Thanks, Mom.) To make everything worse, we have to journal about our time at camp so the adoption agency can do some kind of "where are they now" newsletter. I'll tell you where I am: At Camp Little Big Lake in a cabin with five other girls who aren't getting along, competing for a camp trophy and losing (badly), wondering how I got here...and where I belong. Told through a mix of traditional narrative and journal entries, don't miss this funny, surprisingly sweet summer read! 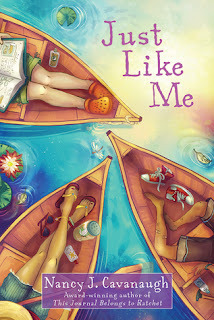 Just Like Me was written by Nancy J. Cavanaugh and published by Sourcebooks Jabberwocky in 2016. Julia’s struggle with her Chinese background and her adoption agency “sisters” showed me a perspective on adoption I hadn’t thought about before. This book also tackles the problem of getting along with people with different personalities and developing friendships. I liked that there wasn’t an easy solution to the “mean girl” problem. I always like it when letters tell part of the story. This is a good example of a story where letters an interesting layer and also keep the plot moving. Nancy Cavanaugh is the author of This Journal Belongs to Ratchet and Always, Abigail. Robots and trains in the same book? What a cool idea! This one reminded me a bit of the classic story The Little Engine That Could by Wally Piper, but with a very modern approach. Trainbots are getting ready to make and deliver toybots for kids to play with, but it looks like the Badbots are sneaking and scheming to sabotage the delivery in this moving, grooving picture book! These Trainbots are getting ready to make and deliver toybots for kids to play with! They’re drawing, sawing, and building to get the toybots ready to send, but it looks like the Badbots are sneaking and scheming to sabotage the delivery! Luckily, the Trainbots draft and craft and engineer and rockateer to outsmart the misbehaving Badbots. And once the toybots are delivered, the kids become their FRIEND-bots 'til-the-end bots! 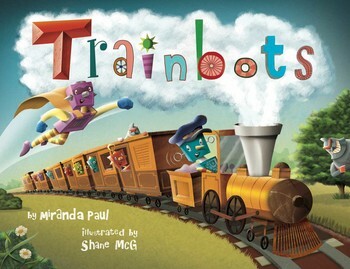 Trainbots was written by Miranda Paul and illustrated by Shane McG. The publisher is Little Bee Books. I received a Fold & Gathered review copy from the author, but the finished book will be available very soon! The release date is June 7, 2016. The illustrations remind me of animated films – bright and dynamic, with fun expressions on the character faces. The idea of putting robots, trains and superheroes together is perfect for helping to capture the interest of young students. I especially liked how blueprints and plans were included in the story, because I’m always encouraging students to draw plans while building in my kindergarten classroom. Build your own trainbot using materials such as cardboard boxes, wooden sticks, graph paper, buttons, googly eyes, etc. Paint and decorate! Make up a character card for one of the trainbots: draw a picture, and list your character’s superpowers, special skills and name. What is your favorite page in the story? Explain or write about why you picked this page. Check out Writer's Rumpus for more about this book and an interview with author Miranda Paul. When I first saw this book, I was intrigued by the title and the cover. It's the last of the nominees for the 2016 Silver Birch Fiction Awards that I needed to read before the results come in! The winner will be announced on May 18. Jelly Miles would rather be playing video games with his best friend P.B. than preparing for a speech competition. In fact, he’d rather be doing just about anything else. So he’s as surprised as anyone that he’s taking this year’s competition seriously. At first, it’s for the awesome prize. But when the competition turns ugly, Jelly realizes it’s his chance to finally get the last word with the class know-it-all. With his reputation, self-respect and the friendship he values most on the line, can Jelly find the courage to get up in front of the whole school and show his true self? Laugh-out-loud funny, Speechless is about standing up to bullying, knowing who your friends are and finding your own unique voice. 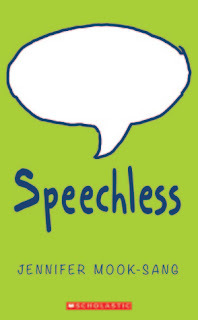 Speechless was written by Jennifer Mook-Sang and published by Scholastic in 2015. Jelly’s character had some interesting hobbies (e.g., ventriloquism) and skills (e.g., he’s a computer genius) but what I really loved most about his character was his humor. He had a realistic personality that hooked me from the beginning of the story. 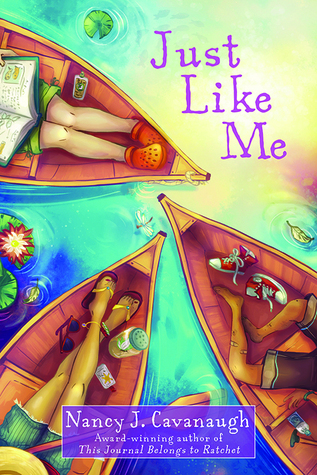 This book tackles typical middle grade themes such as bullying, friendship and learning to be yourself. I really liked the way the author used a speech contest as the backbone of the plot and built the other events around it. It kept the story focused but allowed room to explore and connect other subplots, such as Jelly’s work with the food bank. Jennifer Mook-Sang lives in Burlington, Ontario. 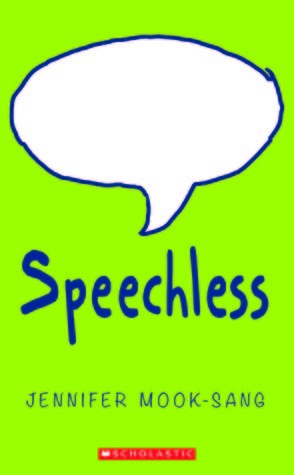 Speechless is her first middle grade novel. Reflect: Have you ever given a speech? What was the most difficult part of it for you? Think of one strategy to help yourself work through that challenge. Think up your own set of steps or strategies for giving a speech. Create a comic or short story that uses all your steps. Create your own anti-bullying slogan or use Jelly’s (Speak Up, Speak Out) and design an anti-bullying poster. After reading The Most Magnificent Thing, I am a big fan of Ashley Spires, and this one is another great book to read in a classroom! 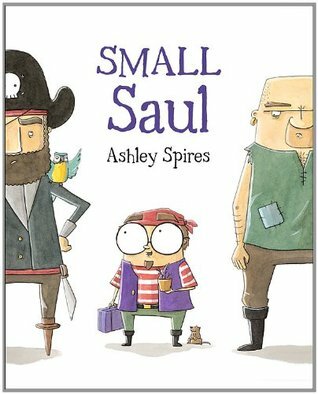 Small Saul's high-seas adventure is a light-hearted celebration of individuality, perseverance and being true to one's self. Small Saul was written and illustrated by Ashley Spires. It was published by Kids Can Press in 2011. I really liked the opening of this book, especially with the dynamic angle that was chosen for the perspective of the first illustration. The introduction of Saul going to Pirate College was a lot of fun. There are lots of small details in the illustrations to add humor to the story. The story is fun (always a great way to get kids to pay attention), but there are also some great opportunities for discussions about how it’s okay to be yourself and follow your own path. There is also a theme of perseverance in the way Saul tried different ways to fit in with the pirate crew. What do you think pirates need to learn at Pirate College? Make a list. Draw a treasure map and label it. Make puppets and a pirate ship and act out the story of Small Saul. The publisher also provided some ideas for using this book in the classroom. I really like survival stories so I really enjoyed this book! It’s another of the nominees for the 2016 Silver Birch Fiction Awards from the Ontario Library Association. Flynn hates the outdoors. Always has. He barely pays attention in his Outdoor Ed class. He has no interest in doing a book report on Lost in the Barrens. He doesn't understand why anybody would want to go hiking or camping. 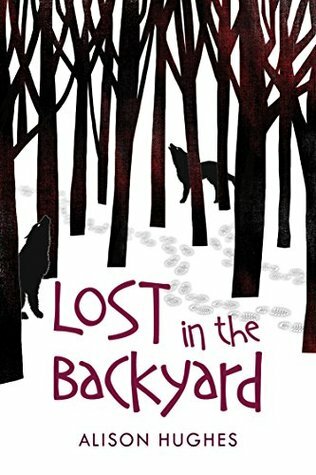 But when he gets lost in the wilderness behind his parents' friends' house, it's surprising what he remembers—insulate your clothes with leaves, eat snow to stay hydrated, build a shelter, eat lichen—and how hopelessly inept he is at survival techniques. 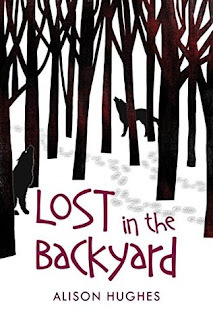 Lost in the Backyard was written by Alison Hughes and published by Orca Book Publishers in 2015. Flynn was an interesting character, who’d much rather be playing a video game than tromping around in the woods. I was really pulled into the story by his thoughts and the character voice. Even though it becomes a life or death situation, there’s a lot of sarcastic humor in this fast-paced novel. I really like how he surprised himself with what he remembered, and how he didn’t give up, despite his predicament. For writers: This is a great example of an adventure story with a first-person narrator. It’s short, so easy to analyze the plot. What stands out the most for me is the main character’s voice – it’s very realistic and engaging. On a Scale From Idiot to Complete Jerk, about a boy and his science project about jerks. Discuss: What were Flynn’s biggest mistakes? How did he overcome the challenges to survival? Create a “map” of the story, showing where Flynn encountered his obstacles. Read another survival story (see this list of Alternatives to Hatchet for other options). Compare some of the obstacles and skills the main characters used for survival.